LAS VEGAS — The Lakers chased another star. Once again, that star ran away. This time, the reasons had nothing to do with personality conflicts with teammates, salary or a poor sales pitch in its meeting. Kevin Durant did not grant the Lakers a meeting at all namely because he figured it would be a waste of time. LAS VEGAS — The positive energy emerged in numerous ways for a Lakers organization that struggled finding any of that in recent years. D’Angelo Russell looked invigorated under a more aggressive game and a more nurturing coaching staff. Until he sat to treat a sprained right hand, Larry Nance Jr. seemed unstoppable with his countless dunks and hustle plays. Ivica Zubac became an instant fan favorite for his pure enthusiasm, his constant blocks and his commanding post presence. Brandon Ingram appeared determined both to show his potential and fight through his initial shooting struggles. For all the warm feelings the Lakers’ young core generated through Summer League, one player from that group walked away frustrated with how things turned out. 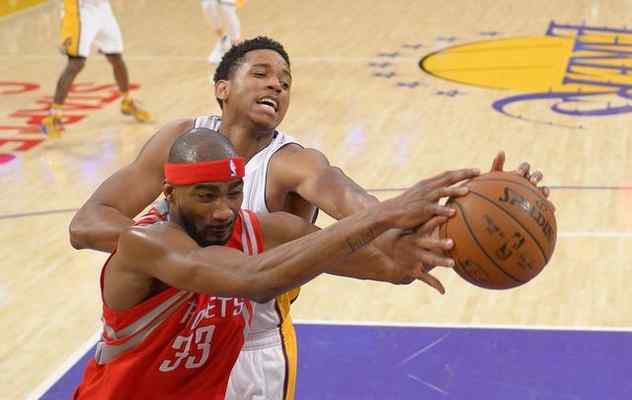 “I definitely was not happy with my offense all week,” said Lakers second-year forward Anthony Brown. LAS VEGAS — The viewing party started at 4:30 a.m., an ungodly hour usually only reserved for extended stays here at the casinos and posh nightclubs. 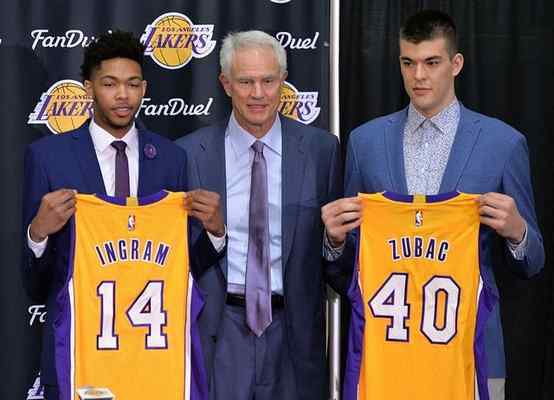 For Ivica Zubac’s friends and family members in his native Croatia, however, that marked the time his close ones would watch the Lakers’ 19-year-old rookie center. There, Zubac provided the same kind of excitement generated when a gambler throws all of his chips in on the correct number at the roulette table. Zubac sparked several cheers from the partisan Lakers crowd for his timely blocks, promising post presence and infectious enthusiasm. He earned new nicknames, ranging from “ZUU,” “Big Z” or “ZU-BLOCK.” And after Zubac averaged 10.6 points on 64.7 percent shooting and 7.2 rebounds during summer-league play, the Lakers believe they found something more than what a No. 32 draft pick can usually offer. Bold words considering Gasol morphed from a burly Spaniard into one of the NBA’s most dominant centers. Gasol has made two All-Star appearances (2012, 2015) and won the NBA’s Defensive Player of the Year award (2015). At this stage of his early career, Zubac has actually developed quicker than Gasol. After all, the Lakers did not blink whatsover when they traded his rights after selecting him 48th overall in the 2007 NBA draft. Not only did that move represent part of the deal to Memphis that secured his brother, Pau, and two subsequent NBA championships. The Lakers considered Marc Gasol a long-term project. As for Zubac, he showed it would not take long to show off his array of skills. LAS VEGAS — Everywhere Brandon Ingram turned, he could have easily noticed the finality approaching. 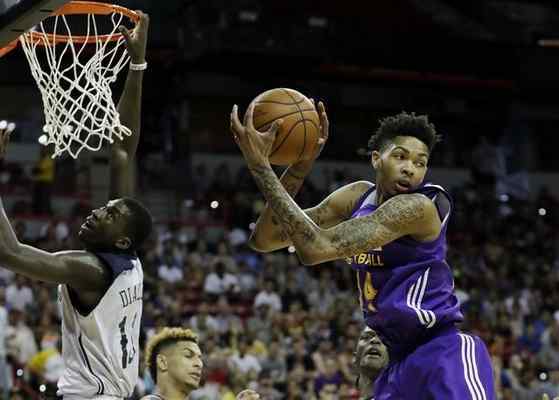 Yet, the Lakers’ 92-88 loss to the Utah Jazz in their consolation game on Friday at Thomas & Mack Center showed how Ingram’s work just started. Ingram also has another source of motivation that will keep him busy while most of his summer-league teammates will enjoy some rest. Starting on Monday, Ingram, Russell and Lakers third-year forward Julius Randle will begin training with the U.S. Men’s Select team at UNLV. Then, that team will practice against the U.S. Men’s Olympic team. Robertson rattled off his hopes how Ingram learns as much as he can about those stars’ work ethic, professionalism and endless nuances that lifted them to stardom. Ingram’s bucket list seems even more detailed. LAS VEGAS — The pain seemed immediately evident as Lakers forward Larry Nance Jr. landed on the court with a loud thud. The ominous signs continued when Nance needed ice to treat a right wrist he believed was broken. Nance’s fears, however, did not turn into a nightmare. An MRI taken on Friday showed that Nance has a sprained right wrist without any fracture or ligament damage. Nance will not play in the Lakers’ summer-league finale against the Utah Jazz on Friday at Thomas & Mack Center. But with the Lakers listing Nance as day-to-day, it appears likely he will report to training camp in late September fully healthy. Nance took a hard fall in the waning seconds of the Lakers’ loss to Cleveland on Thursday. Nance then had x-rays that indicated a probable fracture. But Nance traveled to Los Angeles to visit Lakers physician Dr. Steve Lombardo and hand specialist Dr. Steve Shin of the Kerlan-Jobe Orthopaedic Clinic on Friday for further clarity. There will never mark a time where Kobe Bryant will ever play in an NBA game again. So those five NBA championship runs and endless clutch performances will represent nearly all of what Bryant accomplished in his 20-year NBA career. So will his endless ability to overcome injuries. As Bryant accepted the ESPY Icon award on Wednesday at the Nokia Theatre in downtown Los Angeles, the Lakers’ former star made it clear, however, he has yet to write the final word on his legacy. 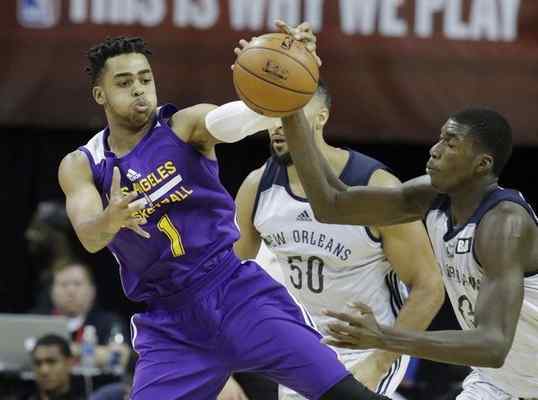 LAS VEGAS — There marks a chance the Lakers’ summer league schedule could overlap with the practice schedule for the U.S. Men’s Olympic team in Las Vegas. Randle and Brandon Ingram are playing for the U.S. Men’s select team. Neither Mermuys nor Russell were initially aware of the arrangement. It appeared likely, however, Russell and Ingram will play in all the Lakers’ summer-league games. Randle is not playing in Summer League since he is a third-year player. 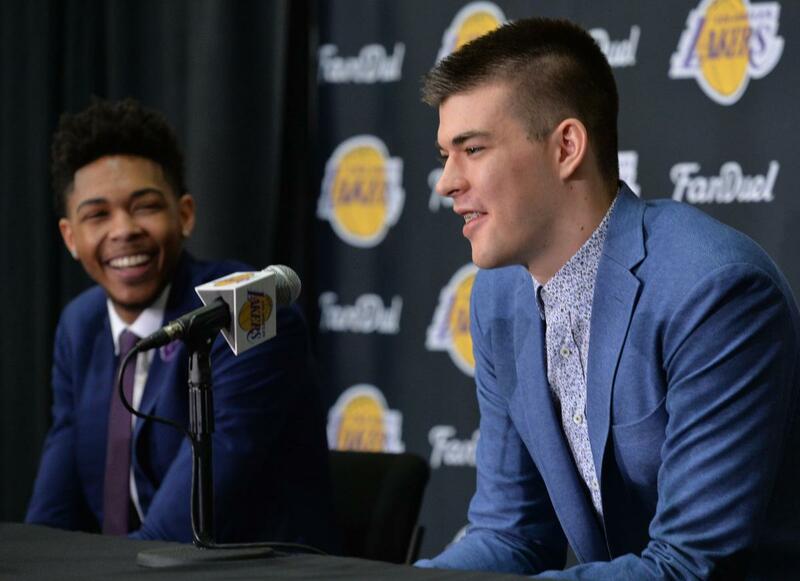 Lakers press conference to introduce 2016 draft picks Brandon Ingram and Ivica Zubac at practice facility in El Segundo Tuesday July 5, 2016. Zubac gets a laugh from media. LAS VEGAS – The attempt once earned Andrew Bynum a quick trip to the bench. The concept became a disturbing trend to former Lakers coach Byron Scott. 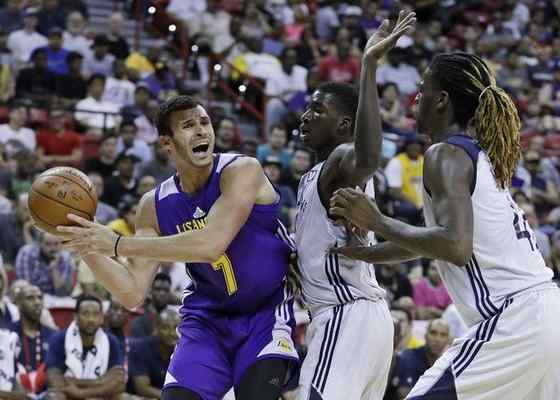 But Lakers coach Luke Walton views the 3-point shot differently. After serving as an assistant with the Golden State Warriors as they perfected their outside shooting in the past two years, Walton plans to maximize that philosophy with a younger and more unproven roster. So much that the Lakers have encouraged rookie center Ivica Zubac to extend his range. Zubac has not taken any 3-pointers yet through three summer league games. Yet, he has averaged nine points on a 64.3 percent clip based off a mix of post-ups and jumpers. His infectious enthusiasm has gone beyond playing for his childhood team. He shared, “I really love the system” after the 19-year-old Bosnian native felt constricted when he played in Croatia. LAS VEGAS — As he moves all over the court, Brandon Ingram feels an overwhelming sensation that does not involve nerves, fatigue or information overload. Instead, it all points to the Lakers’ No. 2 draft pick suddenly becoming bait for his opponents to bite. Ingram stands at 6-foot-9 and is listed at 190 pounds. He has said he actually logs at 195 pounds after previously weighing 169 pounds during his freshman season at Duke. There might be a discrepancy on just how skinny Ingram is. But no discrepancy has emerged on what has become a priority on Ingram’s scouting report. The Lakers may have imposed their will with 78-65 victory over the Golden State Warriors on Monday at Thomas & Mack Center. Ingram, however, encountered suffocating defenses that the Lakers attributed to him scoring only seven points on 0-of-5 shooting. 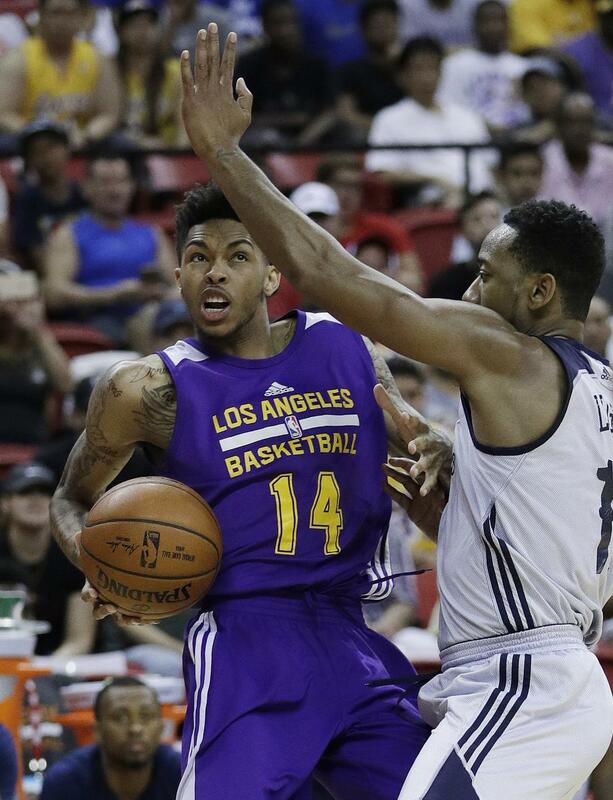 After posting 12 points on 5-of-9 shooting in the Lakers’ summer league opener against New Orleans, Ingram followed up with a seven-point effort on a 3-of-12 clip against Philadelphia. Yet, the Lakers have seen something that a box score cannot document. It also has become a good sign that explains why neither the Lakers nor Ingram seem too concerned with his shooting inconsistency. LAS VEGAS — The crowd went abuzz over Ivica Zubac, and this time the roars had nothing to do with his blocks or his infectious energy. Instead, the Lakers’ rookie center experienced his first rude awakening in the NBA after Bosian-born 19-year-old played overseas in Croatia. Philadelphia forward Jerami Grant drove baseline and leaped over the 7-foot-1, 240-pound center in the Lakers’ eventual 70-69 victory over the Sixers on Saturday at Thomas & Mack Center. The act did not just put Zubac on his first poster. Grant also made the incident extra humiliating after curling his right leg over Zubac’s head to avoid any contact. A reporter then informed Zubac that his Wikipedia entry indicated that he “died” from the experience. “I did a little bit,” Zubac said.